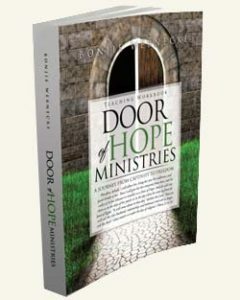 Door of Hope Ministries started as a book, “Door of Hope: A Journey from Captivity to Freedom“. This book, written by Bonjie Wernecke, chronicles the steps God gave her to bring about healing for an emotionally wounded individual. 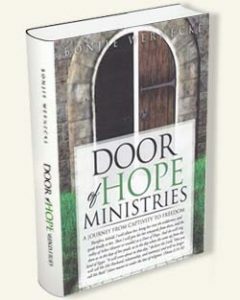 Please, join me on a journey of hope.” “DOOR OF HOPE: A Journey from Captivity to Freedom” Written by Bonjie Wernecke founder and director of Door of Hope Ministries. This book explains a 21 step process to begin our own journey to the freedom found in intimacy with Christ. Bonjie gives her Bible Study notes and scriptures to allow others to lead a group or study God’s Word and achieve the purpose filled life God intended for each of us. A workbook for participants in a Door of Hope class. Come join others learning and participating in inner healing for a life dependent upon God, the Father. Come to the Lord as the victim, set up for abuse. Change your allegiance from the ones who victimized you and come to the Lord for RELEASE through FORGIVENESS! Come to the Lord in brokenness and ask Him to restore what has been taken! He sets us free from our dependence on others. We can count on Him for RESTORATION! Come to the Lord where the process of restoration has begun and we can now see a manifestation of the REWARD and begin a NEW LIFE!